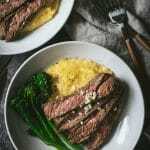 This skirt steak with blue cheese polenta is an easy gluten-free dinner option. 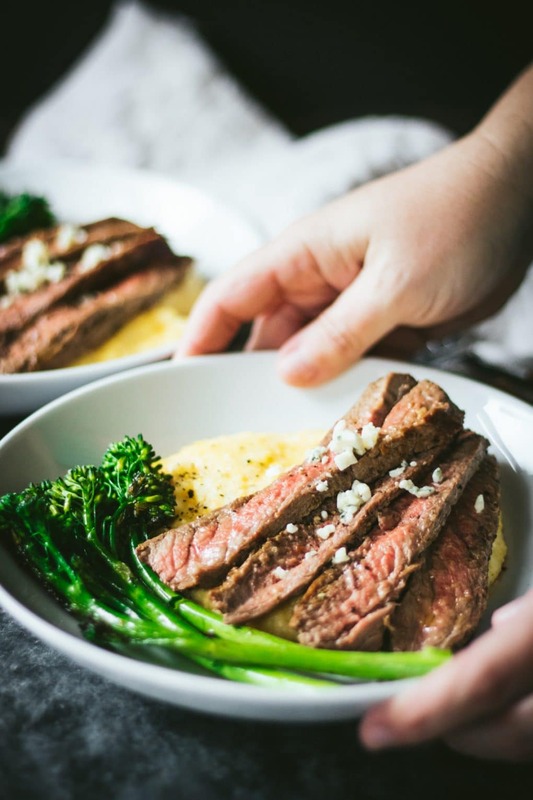 Simple pan sear the skirt steak and whip up the blue cheese polenta and you’ll have dinner ready to eat in under 30 minutes. 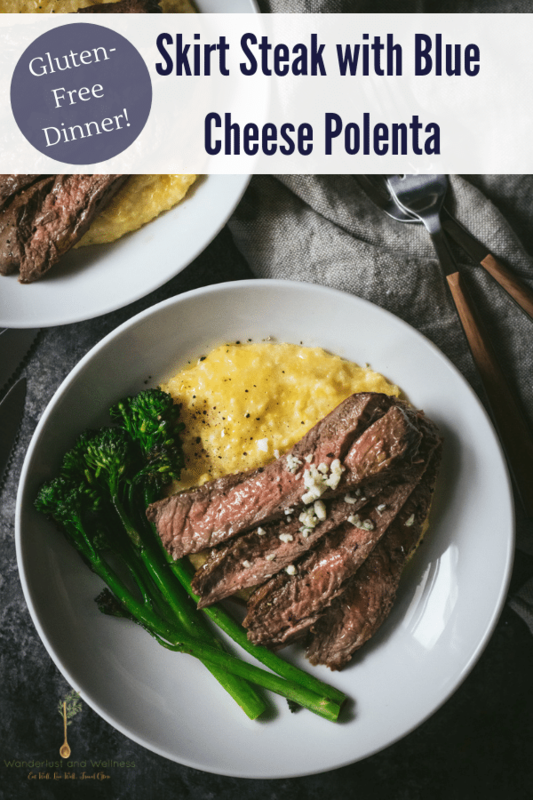 Gluten-free dinner options don’t have to be complicated, which is why I love this skirt steak with blue cheese polenta recipe. It features Certified Angus Beef ® brand skirt steak and creamy gluten-free polenta from Bob’s Red Mill. Pan-searing skirt steak is a cooking technique I recently started using for my steaks, especially when the temperatures outside aren’t grill friendly. Your steak will be finished cooking in a matter of minutes, with all the juicy flavors you get when grilling. You may have a few questions regarding this recipe like how to pan sear your steak, how to slice skirt steak, how to cook polenta, what is polenta, and more. 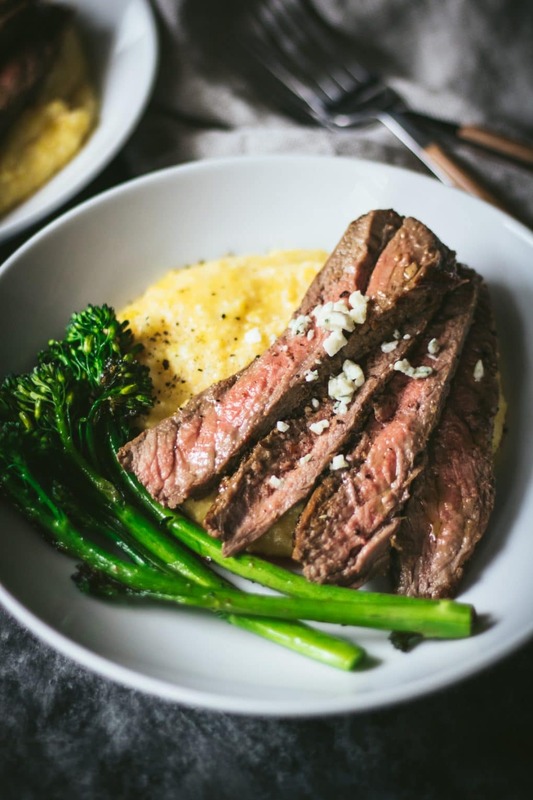 Below are a few recipe FAQs to help you as you approach this skirt steak with blue cheese polenta recipe. Can you sear a steak in a nonstick pan? To pan sear a steak you’re going to want a high temperature, which doesn’t work well with nonstick pans. The recommendation for pan searing steak would be to use a stainless steel or cast iron skillet. Do you cut skirt steak with or against the grain? How you cut your steak affects how tender it is. You want to slice the steak across the grain. First, find the direction of the grain, or the direction the muscle fibers are aligned. Skirt steak has more tough muscle fibers than other cuts, so this step is important. Then, you’ll want to slice across the grain rather than parallel with it. Skirt steak by nature has more tough muscle fibers, which is why slicing it against the grain is important. Additionally, because it’s a more tough cut of meat, you should cook your skirt steak no higher than medium rare to keep a tender texture. Polenta is actually a dish that historically comes from Italy. It’s made with coarsely ground cornmeal and is very similar in texture to grits. It can be served as porridge or can be formed and baked or fried, such as with polenta fries. Pan searing your skirt steak is an easy process with just a few simple steps. Heat your cast iron or stainless steel skillet on medium-high. Add 2 tablespoons of butter and let melt. Generously season your skirt steak with salt and pepper. Once the butter is melted, add the skirt steak to the skillet and let cook for three to four minutes on one side. Then, flip and cook for three to four minutes on the other side. Gently cut into your skirt steak and check that it is medium-rare. You can also use a meat thermometer in the thickest part of the steak to check the temperature (130 degrees for medium-rare). Check out these additional gluten-free dinner ideas! In a large saucepan, bring 6 cups of water to boil. Add the polenta and stir, then reduce heat and simmer gently for 30 minutes, stirring frequently. While the polenta is cooking, heat the cast iron or stainless steel skillet over medium-high heat. Add 2 tablespoons of butter and let melt. Season both sides of the skirt steak with the salt and pepper. Add the skirt steak to the heated skillet and let sear on one side for 3-4 minutes. Then flip and sear the other side for another 3-4 minutes. Check the temperature for medium-rare (130 degrees) and then remove from skillet once it’s reached medium-rare. Let the skirt steak rest while you finish the polenta. Once the polenta has finished cooking, add 3 tablespoons of butter and the blue cheese crumbles and stir until melted and combined. Gently slice the skirt steak across the grain into thin slices. Serve with the polenta and a vegetable of your choice.